Fitting standard toilets and comodes, sitz baths are portable and can be used in a variety of healthcare settings (Hospital, Long Term Care, and Home Care). 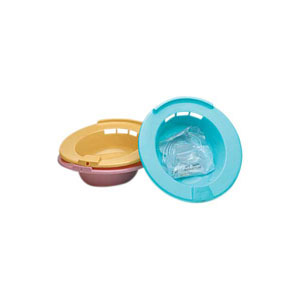 With rounded edges for comfort and ease of handling, sitz baths are perfect for administering soothing irrigation directly to the perineal area. Each set contains a 2000mL bag, 60" tubing, adjustable clamp, basin, and easy to follow instructions printed directly on the bag. Polypropylene basin and clamp/PVC bag and tubing.